Varieties of cool season grasses. Cool season grasses - Which one is best for my lawn? The most common cool season grasses are bluegrass seed, fescue grass seed (tall fescue, creeping red fescue, hard fescue and chewing fescue) and rye grass. It is the most common cool season grass in the midwest and northern regions of the US and Canada. It's adaptability makes it a common choice in these areas. The best time of year for planting grass seed is in the Spring and Fall. 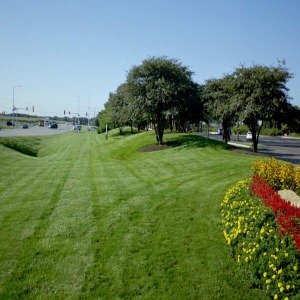 Most sod is made from Kentucky Bluegrass. It has a deep green/bluish color. It has a fine texture with a narrow leaf blade. It is not salt tolerant. It has a high tolerance for mowing. It is a very durable grass. It's ability to spread by underground stems provides denser grass areas. It's ideal height is 2 ½ – 3 ½ inches long. It can tolerate some shade, but prefers sunlight. It thrives in clay and loamy soils. This cool season grass thrives during cooler temperatures. It recovers nicely after the hot summer heat, mid-summer drought and cold spells. It has good weed tolerance when it is mowed at higher levels (2 ½ to 3 ½ inches in height). It has a longer grass seed germination time. It typically takes 14-28 days to germinate. It is not a deep rooted grass. It doesn't hold nutrients and water well. It requires more frequent fertilizing (3 – 5 times per year) and watering than other cool season grasses. It goes dormant in extreme heat and drought conditions. Diseases can occur in bad weather and when the lawn is mismanaged. Common diseases are leaf spot, necrotic ring spot, snow mold, rust and summer patch. Common pests are grubs, sod webworms, chinch bugs and green aphids. high quality grass seed mixes. It is often mixed with bluegrass seed to develop a grass that is more shade and drought tolerant. It is typically grown in the Coastal Northwest, higher elevations and the Great Lake Regions. Creeping red fescue is best to plant in the Spring and Fall. The typical grass seed germination time is 5 – 14 days. It has a dark green color. It has an extremely fine texture and narrow blade. It is a longer growing grass (2 - 4 inches) of the cool season grasses, which means it requires less mowing. It is not a dense grass. It grows well in acidic soil. It creates a uniform look with bluegrass. It has a high tolerance for cooler temperatures. It tends to creep which helps in it's establishment and filling in bare spots. It has a lower chance of disease. Common diseases are leaf spot, necrotic ring spot and rust. It has a lower chance of pest infestation. Common pests are grubs, sod webworms and green aphids. It is less likely to form thatch. It has fair heat tolerance. Other fine fescues have better heat tolerance. It doesn't like wet soils or clay. It is slower than bluegrass seed in filling in the bare spots. It doesn't do well in high traffic areas and it doesn't stand up to wear and tear very well. From Cool Season Grasses to Grass Types. This seed can be found in shade and low maintenance cool season grasses. It especially mixes well with bluegrass seed and rye grass. It is shade and drought tolerant. It is also more heat, drought and disease tolerant than other fine fescues. It is mostly grown in the higher elevations of the Northern United States and Canada. It is best to plant hard fescue grass seed in the Spring and Fall. The typical grass seed germination time is 5 – 14 days. It has many of the same characteristics as the Creeping Red Fescue. It has a high salt tolerance. It is a longer grass that grows in patches making it slower to fill in bare spots. It thrives in loamy and silt soils. It has better heat tolerance than other fescue seed. It is one of the low maintenance cool season grasses. It needs to be fertilized approximately 2 -3 times per year. It works well on slopes and banks. It is more disease resistent than other fescues. It has a lower chance of disease and pest infestation. It is a slow growing grass. It has a shallow growing root system so it is slow to recover from wear and tear. Can also be found in shade and low maintenance cool season grass seed mixes. Grows in bunches which makes it harder to fill in bare areas. This type of grass can be used as pasture grass or in a more manicured traditional lawn. It is grown in the Northern United States, Canada and the Northwest Coastal Regions. It is best to plant chewing fescue grass seed in the Spring or Fall. The typical seed germination time is 5 – 14 days. It has many of the same characteristics as red and hard fescues. It is a very aggressive growing grass. It thrives in sandy and loamy soils. It has many of the same advantages as other fescue grass seed. Because of it's aggressive nature, it is good at crowding out weeds. It is relatively low maintenance. You typically have to fertilize between 2 and 3 times per year. It is very shade tolerant. Generally, it has few insect problems (white grubs, sod webworms and green aphids) and disease problems (leaf spot, necrotic ring spot and rust). It does well in sandy, acidic and low maintenance soils. It is slow to fill in bare areas and become established. It is a very aggressive grass so it may overtake other turf grasses. It does not do well in high traffic areas and is slow to recover from the wear and tear. It may develop thatch easily in acidic soils. 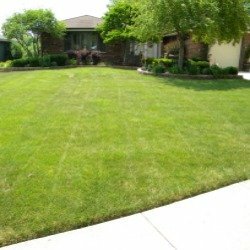 Perfect for the homeowner looking for a drought tolerant and low maintenance grass. Great for lawns growing in sandy soils and other areas where water and time for lawn care maintenance is limited. This is one of the best grasses to grow in the transition zone. It is best to plant in the Spring and Fall. The typical gras seed germination time is between 7 and 14 days. It has a medium green color. It has a medium to coarse texture. It's growing height is 2 ½ – 3 ½ inches. It has a deep and extensive root system. It can thrive in all soil types. It is a low maintenance grass. It doesn't require a lot of mowing, watering or fertilizing (2 – 4 times per year). It has a high shade, heat and drought tolerance level. It is pest resistant. The only real issue could be white grubs. It stands up to wear and tear well. It's appearance can be clumpy. It doesn't mix well with other grasses. It is slow to fill in bare and sparse areas. Prone to a few diseases such as leaf spot, necrotic ring spot and rust. Rye grass is included in both sunny and shady lawn seed mixes. This grass type grows quickly, prevents erosion and serves as mulch until the slower germinating grasses (bluegrass seed and fescue seed) grow. This grass seed type is inexpensive and will temporarily fill in bare spots. Because of it's rapid growth, some use rye grass alone to fill in high traffic areas. It is best if it is planted in the Spring and Fall. It is often overseeded with warm season grasses to make them green in the winter. The typical grass seed germination time is between 3 and 14 days. It has a deep green color. It has a medium texture with a fine leaf blade. It has fair salt tolerance. It's growing height is 2 – 3 ½ inches. Doesn't require a lot of soil preparation. It establishes a lawn quickly. Generally, it is pest resistant. Common pests are white grubs, sod web worms & chinch bugs. It is a hardy grass because it is typically blended with other cool season grasses. It does not do well in shade, extreme cold or heat and drought. It is not as cold tolerant as bluegrass seed or drought tolerant as tall fescue seed. It is a high maintenance grass. It requires watering, frequent mowing and fertilizing 3 – 5 times per year. In the spring there may be bare spots and weeds are prone to move in before bluegrass and fescues have a chance to fully grow. It is prone to a few diseases such as leaf spot and rust. From Cool Season Grasses to Homepage. Roadside picture in the Chicagoland Area. Grass is a mixture of Kentucky Blue Grass, Fescue and Rye Grass. Schaumburg, Illinois home with a mixture of kentucky blue grass, fescue and rye grass. 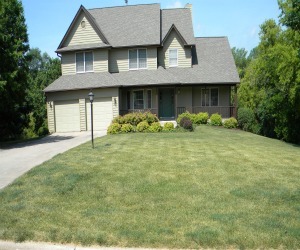 Coralville, Iowa home with a mixture of blue grass, fescue and rye grass. Grass is already beginning to go dormant in mid-June due to the lack of rain in spring/early summer.